Another painfully hot night coupled with a beast of a hangover made for an unpleasant start to the day. David and I managed to make it out of the hostel in time and headed towards the station. Antwerp Centraal is an incredible building, magnificent in the same way that many of London’s larger stations are. However, due to it’s overwhelming size and the lack of directions from the station entrance, it was quite a challenge to find the platform for the train to Rotterdam. We eventually found the platform several floors down, and once on the train it was announced (fortunately in English) that due to engineering works we would have to change trains. It seemed odd that one train couldn’t get us to Rotterdam, but another would have no problem in continuing the same journey. Once we had finally reached Rotterdam we were met with the welcoming sight of a station under construction which, as we would later find out, was the same state much of the city was in. We stopped of at tourist information office to buy a map, which unlike those that we had been given in Belgium were not made for young travellers by locals but by a governing body who clearly had no idea about what information was important. We found the hostel on the map and headed through the city to some buildings of particular interest which turned out to be the hostel. It turned out that most of the interesting aspects of the city are it’s buildings; a wide range of varying architecture, and the seemingly constant need to out-do itself means Rotterdam has one of the most odd, but admirable skylines. After a short stop to drop our bags we headed down to the waterfront to find somewhere to eat between the city’s iconic bridges. It became apparent to us that, due to the fact that it was Easter Sunday, very few places would be open and we were forced to turn back towards the hostel where we had seen some open restaurants. We both tucked into a burger while enjoying some sunshine before deciding to rest at the hostel and recover from the previous evening’s binge. The following day was greeted with pleasure, an air conditioned room had ensured a good night of sleep which was quickly followed by a hearty continental breakfast. We then headed out into Europe’s largest port to discover what the city had for us. 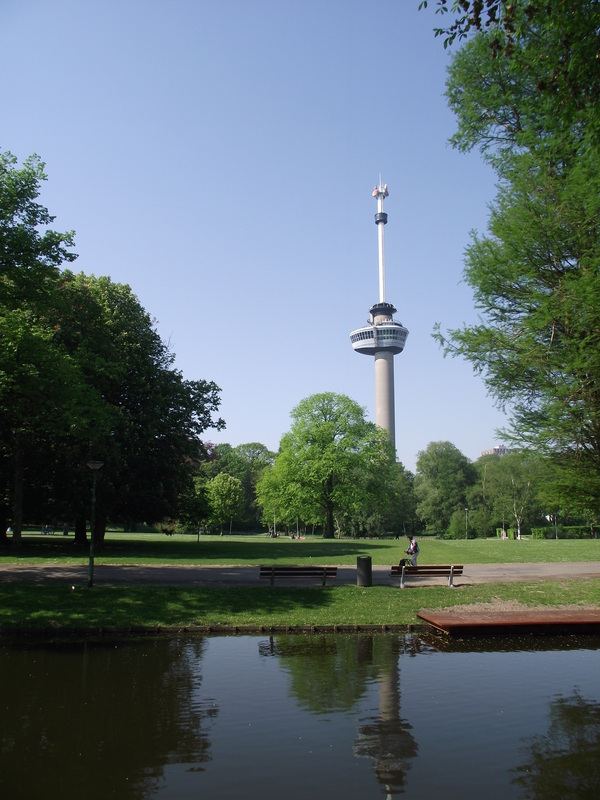 We began once more along the waterfront and walked towards a large park, one of Rotterdam’s best features, which is overlooked by the supposedly famous Euromast that neither of us had heard of; a concrete tower with a viewing deck and revolving restaurant. From the Euromast we pushed on further to find one of the city’s last remaining windmills before heading back into the centre where we found most that most places had remained closed. We returned once more to the hostel to research what we could do before we eventually resorted to indulging in some classic Dutch hedonism. 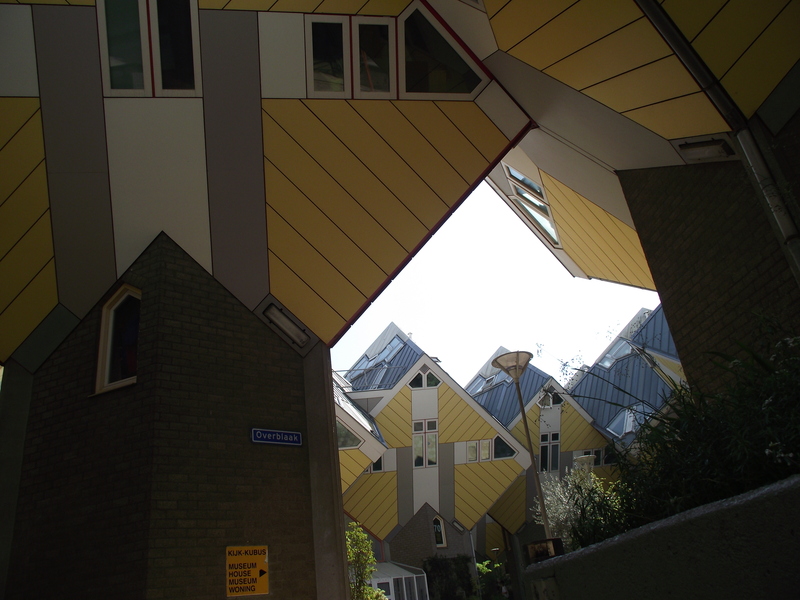 We were both looking forward to escaping from Rotterdam and heading to what had been labelled the party town; Amsterdam. We headed out early and returned to the building site of a station, due to the fact that we had booked a hostel outside of the centre of Amsterdam we took a stopping train and were impressed to find that the second class seats were as good as what would be considered first class in Britain. I always find it such a surprise at how flat the Dutch countryside is and spent much of the journey gazing across the open fields. 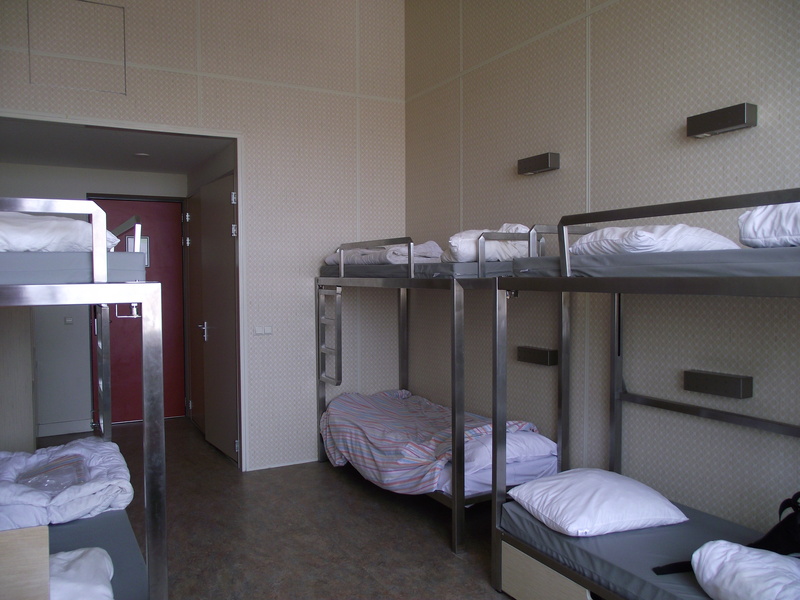 When we arrived in Amsterdam we had a short walk to our hostel which appeared to be more like a hotel. 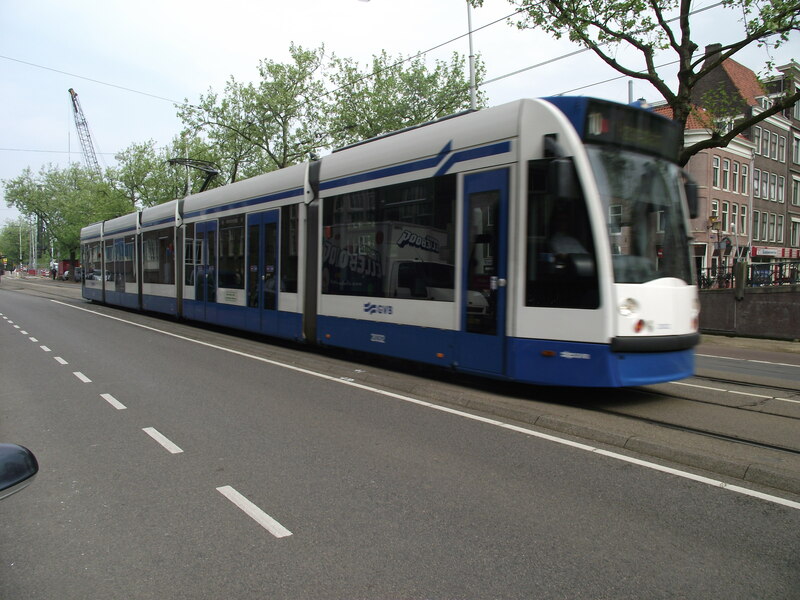 We picked up travel cards for public transport for the few days that we would be in the city and we quickly mastered the tram network, or at least the one tram that went from our hostel into the city centre. I was mostly disappointed when we got the Dam Square as somebody had decided to leave a fairground there, which left it feeling like an area that we should generally avoid. 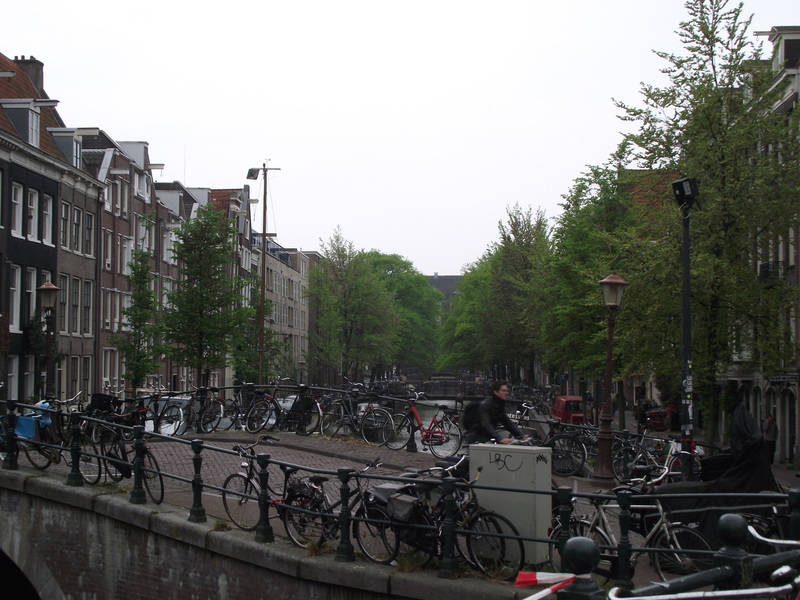 We spent a large part of the afternoon roaming the city and found that we would quickly and easily become confused at every canal and bridge as they all have a fairly similar appearance and it took us a long time to get our bearings, if we ever did. We proceeded to take a late lunch before returning to the hostel to freshen up before returning to the city to enjoy a few beers and the Champions League, following on from which we found ourselves suffering once more from fatigue, anyone would think we were unfit, and returned to the hostel to crash. We began the next day with the now standard continental breakfast over which we discussed whether or not we would ever get bored of eating so much food? The outcome; obviously we wouldn’t. 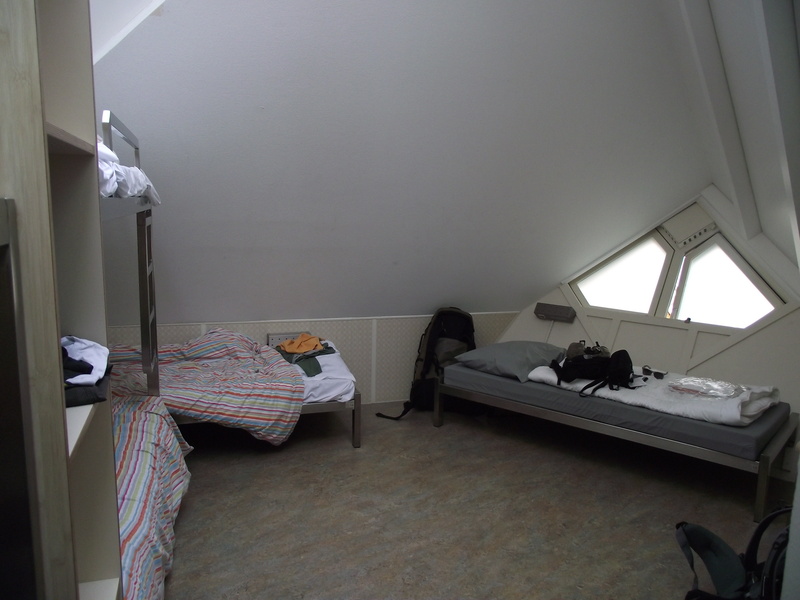 We then discovered that it was possible to buy tickets for a canal trip at the hostel for a discounted price and made the decision that this would be how we would spend the first part of the day. The tour gave an excellent view of the city’s sights, landmarks and many waterways and left us in the museum quarter where we decided on which one to explore. We ended up in Stedelijk; a contemporary art gallery that seemed to deal mostly with the documenting of previous displays it had put on. It was a fascinating way to look at art and it raised the question of whether documentation of art is art itself. One of the current exhibitions covered the use of television in art and displayed the work of artists who had used broadcasting, colour, image and the television set itself as a way of creating a message and conveying an idea; further pushing the idea of documentation as a form of art. Much of the afternoon was dedicated to exploring the city further. By now we thought we were able to distinguish between the canals and bridges, then again maybe not. We eventually found ourselves in the red light district, which seems considerably less seedy than it does at night despite the fact that the only real difference is the lack of a red neon glow. The need for food once again took control and after much ambling about we found a small restaurant where I decided to try a local dish; Hutspot, which consisted of vegetable mash and a meatball which was largely delicious. We then headed back once more to the hostel to freshen up before enjoying yet more football and beers. The meat and cheese challenge that we had so often attempted for dinner in Belgium had now become a standard for breakfast; eating as much as we can so that we would only need one meal during the day to satisfy our hunger. We made our way into the city a little later than usual with the aim of finding Anne Frank’s House. At the hostel we had consulted the map and believed that we would be able to find it without much problem. However, several streets, canals and bridges later we realized that something had been misjudged; at this point David kindly informed me that he had left the map at the hostel and finding the very normal looking house would be down to luck and tourist signposts. On the discovery of the nearby queue that disappeared round a corner, if not several, we decided that the simple view from the outside was more than enough for us. The rest of the morning was spent wondering around The Jordaan, a more calm, residential area of the city before we found ourselves at the flower market where we stopped to watch the world go by. After a long chat on video games we felt the first drops of rain and took the conversation inside to a nearby cafe. For the first time, I opted for a coffee over tea and spent much of my time drinking it deciding whether or not I was enjoying it; I’m still not sure. The world carried on passing us by and we eventually headed out once more into the now returned sunshine to find something to eat. We explored a new part of the city in the hunt for an Indonesian restaurant and on finding one we gorged ourselves on the vibrant delicacies. After finding ourselves quite full, we headed back into the centre to catch the tram back to the hostel for the last time to plan the journey ahead into Germany.